When animals invade a home, the attic is one of the most common areas that they build their nests. As a result, your attic insulation is often compromised by urine and feces as the critters tear it up to build their nests. Not only does this cause your energy costs to go up due to a decrease in insulation efficiency, but it leaves your home smelling foul and can even put your family’s health at risk. Critter Control® of Dallas can remove any damaged or soiled insulation along with the offending critters, and get your home back in top shape. Physical damage to attic insulation is just one of the dangers of an animal infestation. Their waste is known to carry a variety of infectious diseases that can put your loved ones in danger. Diseases like leptospirosis, Hantavirus, and even the plague are a possibility when animals are nesting in your attic. The trained experts at Critter Control® of Dallas use only the most effective removal methods to get the animals out while keeping you and your family safe. If an animal infestation has damaged your attic insulation, we do not recommend attempting to remove or replace it on your own. Many older insulations are made with toxic fibers that if inhaled, pose serious health risks. For a job like this, it’s best to leave it to the professionals. Any animal infestation should be addressed as soon as possible to avoid expensive damage. 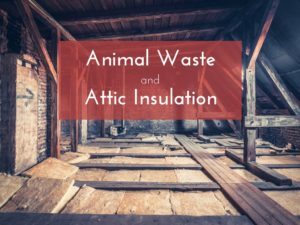 The animal removal experts at Critter Control® of Dallas can efficiently remove any offending critters, and repair any damage they may have caused during their stay in your attic. Don’t let your home fall victim to the dangers of wild animals in your attic, call us today at 817-222-1101.